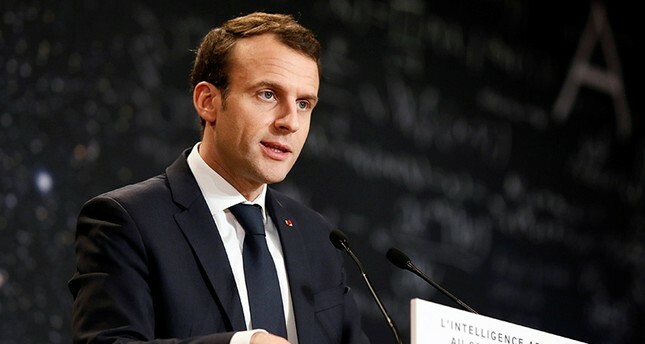 French President Emmanuel Macron said Thursday he has assured the PKK-linked People's Protection Units (YPG) and Syrian Democratic Forces (SDF) in northern Syria of France's support after meeting with leaders of the group in Paris, risking an escalation of tensions with Ankara. A presidency statement said that Macron hopes "a dialogue can be established between the SDF and Turkey with help from France and the international community." Leaders of the terrorist group told Reuters that France promised to send troops to Manbij to support SDF after Thursday's meeting. Turkey has vowed to take initiative to drive YPG and SDF forces out of the northern Syrian city of Manbij if the U.S. does not keep its promises to withdraw the terrorist group. Manbij has been one of the most hotly debated points of contention between Ankara and Washington. Turkey and the U.S. established the working groups to discuss a number of issues, including the stabilization of Manbij, and preventing any undesirable clashes. Ankara's demand from the U.S. to cease arming the YPG and ensure its withdrawal to east of the Euphrates dates back to former President Barack Obama's time in office. The U.S. had promised to meet Ankara's demands, but has not so far, which has strained relations between the two countries. Turkey believes that U.S. President Trump also wants to improve bilateral ties, but that his efforts are undermined by holdovers from the previous administration and establishment officials.